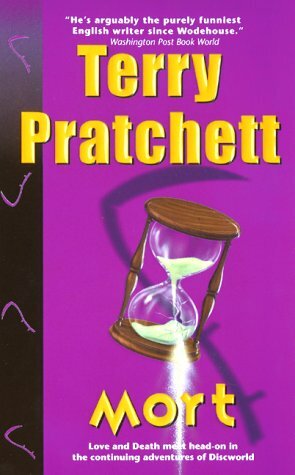 Why: Let the rejoicing begin – the Discworld is officially OFF double secret probation. For those following along at home, you’ll remember back in March we expressed measured disappointment in our review of The Color of Magic. Ever since we’ve longed to buy into the hype and now – we’re back on the Discworld bandwagon, baby! Okay, so the introductory paragraph might have been a bit dramatic. Mort didn’t change our lives or anything like that, but it was a very good read. And quite funny. The character of Mort was well thought out and surprisingly complex in his naivety. The character of Death was a hoot and almost unrecognizable from his other notable appearance in The Book Thief (what range!). Even the plot was engaging and dare we say, suspenseful. Mort was so much more than just the next set up for a series of comical events. We found ourselves immersed in the story and eager to turn the page. I read my very first discworld, A Hat Full of Sky, this past month and rejoiced in the writing and the humor. I want more. Do you suggest that I read Mort next or some other Pratchett book first? The Colour of Magic is one of the only books in the series that I didn't really like. Most of the crap ones are his earlier stuff, and even they're still readable. I love Mort (as well as the other Death books) and think you'd really enjoy Reaper Man. Glad to hear that you aren't letting one bad book ruin the entire series for you. There are over 30 of them and each one is better than the last.